This page includes collector-donated information and documents. Clicking on an image will display either a larger image or a .pdf document (you may need to install Adobe Reader to view .pdf documents). Enjoy! All Clinton radios from the 1930's that I know of have a label that says "Plant A, Chicago." 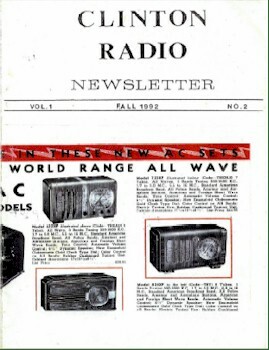 Jim Fred, who worked for Clinton at one time relates that Clinton built radios for others under the names: Bostonian, Buckingham, Corona, Crusader, Cub, Federal, Harmony, Marshall, Nightengale, Universal, and Westminster. The radios made by Clinton will have "Plant A" on the license tag. Clinton shows up in the listings of Chicago corporations from 1933 through 1938. 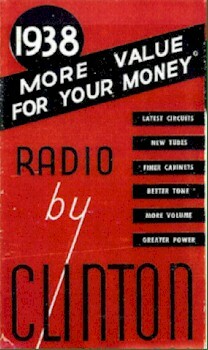 Here is a copy of a 1938 sales brochure from Clinton Radio. Contributed by Jay Kinnard. Click on the image to see a copy of the Clinton Radio Newsletter, Vol.1, No.1, published by Jim Fred. Contributed by Jay Kinnard.